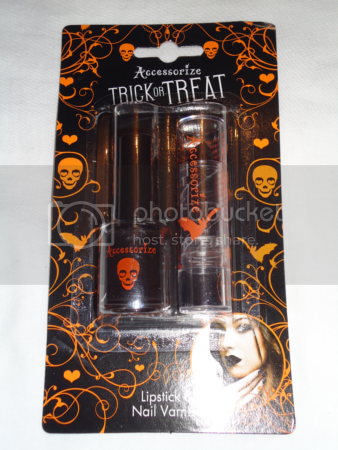 I was in Accessorize at the weekend and zeroed in on their Halloween section. Accessorize always do such lovely things - whether it's jewellery, bags, or make-up - that I was interested to see what they had. Aside from the usual fare like skull earrings, they also had a couple of things that caught my attention...and ended up going home with me! There's nothing really new about black nail polish or black lipstick, but it was only a fiver for the set and I wanted to see if they were any good. The nail polish isn't the best - it's a bit gloopy, which is a problem that lots of black nail polishes suffer from. I really liked the lipstick though. You know how sometimes you buy a dark-coloured lipstick but when you actually put it on, it's quite sheer? This is not like that. This is black. Really, really BLACK. It's absolutely perfect for Halloween. I was really into temporary tattoos (and then a real tattoo!) 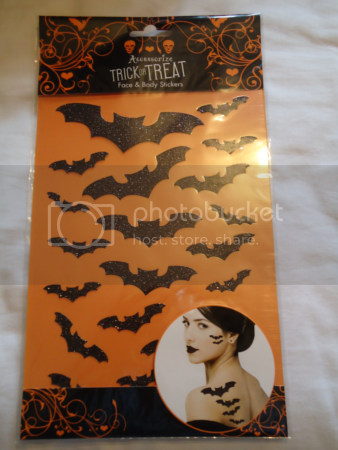 when I was younger, so these bat body stickers reminded me a bit of that. Plus, they're sparkly. You can't go wrong with anything sparkly. 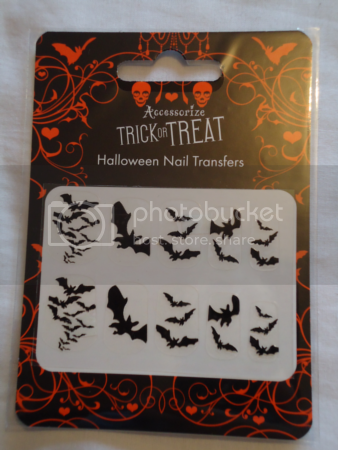 Finally, I bought some adorable bat nail transfers. They were a bit on the pricey side (£2.50) considering you only get enough for one for each finger, but they're so cute that I couldn't resist. I wasn't sure what I was going to go as for Halloween, but given all the bat-related things it looks like I'm going as a vampire bat!